Trains from Kiev & Lviv . . . 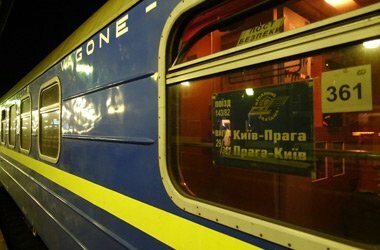 This page explains how to travel by train from Kiev or Lviv to other European cities and how to buy tickets the cheapest way. It may help to know that Lviv is also spelt Lvov, and Kiev can also be spelt Kyiv. Click here to buy tickets starting in another city. Train times updated for 2019. Take a moment to read these tips for buying European train tickets. It answers all the usual questions, "Do I need to book in advance or can I just buy at the station? ", "Can I stop off? ", "Are there Senior fares?" and that old favourite, "Should I buy an $800 railpass or just buy a €35 point-to-point ticket online?". Click here to understand how far ahead you can buy train tickets. 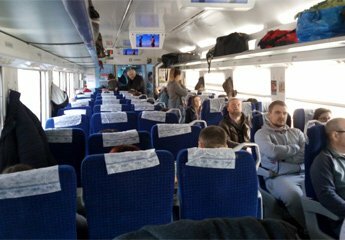 Comfortable trains link most major towns & cities within Ukraine, see the Train Travel in Ukraine section. Information about Kiev main station. 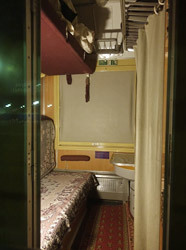 A comfortable direct sleeper train called the Kiev Express links Kiev and Warsaw every night, leaving Kiev main station (also known as Kiev Pass) at 18:30 and arriving at Warsaw Centralna at 10:50 next morning. 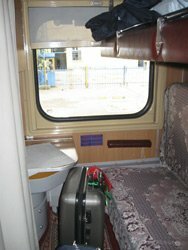 The train has comfortable Ukrainian 1, 2 & 3 bed sleepers with washbasin. Bring your own picnic and beer or wine as there's no catering car. The train is jacked up at the border to have its bogies changed from Russian 5' gauge to standard gauge (4' 8.5"), an interesting experience. You can't book this train online with the operator, but can order online from reliable Polish agency www.polrail.com with tickets collected in Poland or sent to any address worldwide (they cannot be printed out or collected in Ukraine). Booked with www.polrail.com the fare is around €57 including a bed in a 3-berth sleeper, €66 with a bed in a 2-bed sleeper or €110 in a single-bed sleeper all to yourself. You can check the formation of this train if you like at www.vagonweb.cz. Click the UK flag for English, then 'Composition' then TLK against Poland PKP and look for the Kiev (Kijow) Express. It will show you the carriages that make up this train, and if there's a camera logo you can click to see more photos, too. Day 1, travel from Kiev or Lviv to Krakow with one easy change at Przemysl, as shown below. Day 2, take any train you like from Krakow to Warsaw in as little as 2h19 for around €20, booked at Polish Railways www.intercity.pl with print-your-own tickets. (1) Leave Kiev at 06:00 or Lviv at 11:20, change in Przemysl (arrive 12:25, depart 13:09) and arrive Krakow Glowny at 16:09. (2) Leave Kiev at 06:50 or Lviv at 13:55, change in Przemysl (arrive 14:58, depart 15:40) and arrive Krakow Glowny at 18:48. 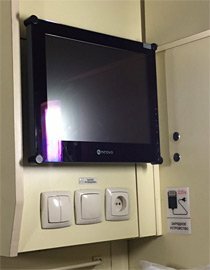 The Kiev-Lviv-Przemysl trains are smart air-conditioned Ukrainian express electric trains, introduced in 2016. The Przemysl-Krakow train is either a comfortable air-conditioned Polish Intercity train or a comfortable slower TLK train (the 16:00 from Przemysl). Times vary, check online. To check times, first check the Ukrainian train at www.uz.gov.ua/en/passengers/timetable. Then check times for a suitable Polish connecting train at Polish Railways www.intercity.pl. Lviv to Przemysl costs €7.10. Przemysl to Krakow costs around €9. You can order Kiev or Lviv to Krakow tickets through highly-recommended Polish train booking agency www.polrail.com. They charge a small fee, and either allow ticket pick up in Krakow or can send to any country worldwide. 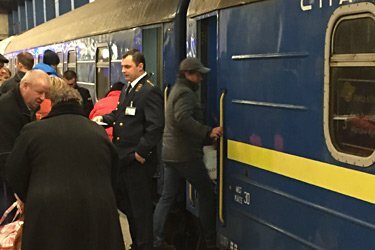 It's now possible to book the Kiev or Lviv to Przemysl train at Ukrainian Railways http://booking.uz.gov.ua/en - if it works for you (or if it doesn't), do let me know. You can then book the Przemysl to Krakow train at Polish Railways www.intercity.pl. A direct sleeper train connects Lviv with Krakow, but it has now been retimed to serve Warsaw, Gdansk & Gdynia so passes through Krakow at silly o'clock. Step 1, travel from Kiev or Lviv to Przemysl, just across the border in Poland, by modern air-conditioned intercity train. Kiev depart 06:52, Lviv depart 13:53, Przemysl arrive 15:03, but times to be confirmed. Lviv to Przemysl costs €7.10. Przemysl to Krakow costs around €9. Book this at the Ukrainian Railways website http://booking.uz.gov.ua/en. Step 2, travel from Przemysl to Berlin by overnight sleeper train. From the timetable change on 9 December 2018, a direct sleeper train will leave Przemysl at 18:36 and arrive Berlin Hbf at 09:16. 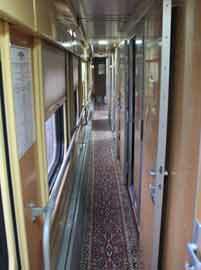 The train will have a Polish sleeping-car with 1, 2 & 3 bed compartments with washbasin. There are also seats cars, but no couchettes. You'll be able to book at www.bahn.de, prices are still to be confirmed but are likely to start at around €59 with a bed in a 3-berth, €89 with a bed in a 2-berth or €129 with a single-bed sleeper. Step 1, travel from Kiev to Warsaw Centralna by Kiev Express sleeper train as shown above, booking through www.polrail.com. Step 2, travel from Warsaw Centralna to Berlin Hbf by EuroCity train. I'd allow at least 2 hours between trains in Warsaw, just in case of delay. Book this at www.bahn.de and print your own ticket. 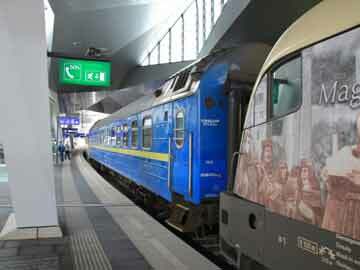 See timetable, photos & travel tips for Warsaw-Berlin trains here. Step 1, travel from Kiev or Lviv to Kosice in Slovakia by direct Ukrainian sleeping-car, leaving Kiev at 18:30 or Lviv at 04:09 and arriving Kosice at 13:54. To book this train contact reliable agency www.polrail.com who can send tickets to you anywhere in the world. 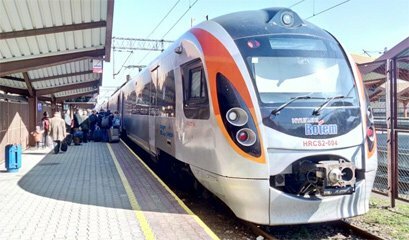 Step 2, travel from Kosice to Prague by air-conditioned tilting SuperCity train, leaving Kosice at 15:00 arriving Prague Hlavni at 22:19. You can book this train at Czech Railways www.cd.cz and print your own ticket. The direct sleeping-car from Kiev to Prague, seen at Prague Hlavni. This sleeper ceased being direct in December 2017, it now runs Kiev-Kosice with connecting train to Prague. You could consider going from Kiev or Lviv to Krakow by daytime train as shown above. Travel from Krakow to Prague by daytime train or spend a day there and take the sleeper, see the Krakow-Prague page for details. 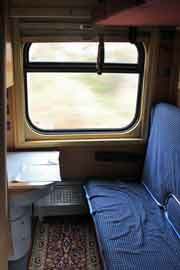 Option 1, Kiev or Lviv to Budapest by direct sleeper train. See Ukrainian news report showing the new Vienna-Kiev sleeping-car service. A comfortable direct sleeping-car leaves Kiev main station at 13:07 and Lviv at 20:00 every day, arriving Budapest Keleti at 08:20 next morning and Vienna Hbf at 11:21. 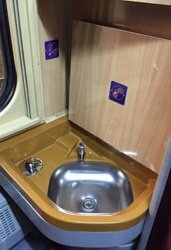 The sleeping-car has 1, 2 & 3 bed compartments with washbasin, see the photos below. At Chop on the border with Slovakia the through sleeping-car is jacked up to have it's wheelsets changed from Russian gauge used in Ukraine (5') to European standard gauge (4'8½"). A modern Slovakian restaurant car is available for breakfast, attached in the early morning at Zahony on the Hungarian side of the Ukraine/Hungary border. Kiev to Budapest costs around €103 in a 3-berth sleeper €114 in a 2-berth sleeper, or €184 in a single-berth sleeper. Kiev to Vienna costs around €138 in a 3-berth sleeper €149 in a 2-berth sleeper, or €241 in a single-berth sleeper. 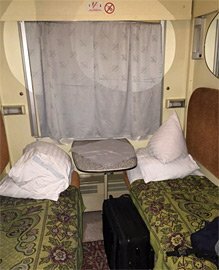 Lviv to Budapest costs around €87 in a 3-berth sleeper €95 in a 2-berth sleeper, or €152 in a single-berth sleeper. Lviv to Vienna costs around €120 in a 3-berth sleeper €129 in a 2-berth sleeper, or €207 in a single-berth sleeper. Booked at the station in Ukraine, Kiev to Vienna costs €80.50 in a 3-berth, €90.50 on a 2-berth or €152 in a single-berth. Lviv to Vienna €62.10 in a 3-berth, €70.10 in a 2-berth or 119.70 in a single-berth. However, this sleeper does get full on occasion. The Kiev-Vienna sleeping-car about to leave Kiev Pass. Photos courtesy of Helmut Uttenthaler. The sleeper is jacked up to have its bogies changed at Chop on the Ukrainian border. Photo Helmut Uttenthaler. The Vienna-Kiev sleeper at Vienna Hbf... Courtesy of Helmut Uttenthaler. Option 2, Lviv to Budapest by daytime train. Step 1, travel from Lviv to Mukachevo (often spelt Mukacheve), leaving Lviv at 06:45 and arriving Mukachevo at 10:57. You can check times and buy online at www.uz.gov.ua, or you can buy at the station, fare around €5. Step 2, travel from Mukachevo to Budapest by direct Hungarian InterCity train Latorca, leaving Mukachevo at 12:30 and arriving Budapest Nyugati station at 18:37. Buy at the station, fare €23. Just one through carriage runs direct from Mukachevo to Budapest, a Hungarian air-conditioned 2nd class car with open-plan seats, power sockets available for laptops & mobiles. 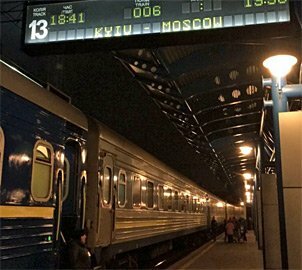 There are several night trains from Kiev to Moscow, run by Ukrainian Railways. They have 2-berth and 4-berth sleepers. There is no problem using these trains as a westerner, the Russia-Ukraine political situation does not seem to be a problem. Times vary by date, but for example train 6 leaves Kiev main station at 19:36 and arriving in Moscow Kievskaya station next morning at 10:09. You can buy at the station, find a local Ukrainian travel agency, or order online from reliable Polish agency www.polrail.com with tickets sent to any address worldwide for a fee. Polrail charge around €94 with a bed in a 4-berth. Train 6 from Kiev to Moscow, boarding at Kiev station. Paris: First travel from Kiev or Lviv to Warsaw, Prague or Budapest. See here for Warsaw to Paris, here for Prague to Paris or here for Budapest to Paris. Brussels: First travel from Kiev or Lviv to either Warsaw or Prague. See here for Warsaw to Brussels. See here for Prague to Brussels. You can travel from Prague to Brussels for as little as €21 and arrive in the evening of the same day you arrive in Prague, so this would be my suggested route. I'd allow at least 2 hours between trains in Prague in case of delay. Amsterdam: First travel from Kiev or Lviv to either Warsaw or Prague, although going via Warsaw will be the faster route. See here for Warsaw to Amsterdam. See here for Prague to Amsterdam. Switzerland: First travel from Kiev or Lviv to Prague or Budapest. See here for Prague to Switzerland or here for Budapest to Switzerland. Italy: First travel from Kiev or Lviv to Prague or Budapest. See here for Prague to Italy or here for Budapest to Italy. Cologne, Frankfurt, Hamburg: First travel from Kiev or Lviv to either Warsaw. See here for Warsaw to Berlin. See here for Warsaw to Cologne, Frankfurt, Hamburg. Munich: First travel from Kiev or Lviv to Prague or Budapest. see here for Prague to Munich or here for Budapest to Munich. Copenhagen & Scandinavia: First travel from Kiev or Lviv to either Warsaw or Prague. See here for Warsaw to Copenhagen. See here for Prague to Copenhagen. Ljubljana, Zagreb, Belgrade: First travel from Kiev or Lviv to Budapest. See here for Budapest to Ljubljana, Zagreb, Belgrade.